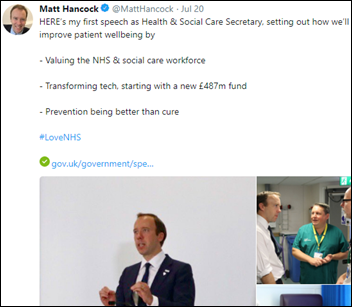 In England, new Health Secretary Matt Hancock pledges his support for NHS modernization and announces $640 million in new technology funding. He touted virtual visits, barcode tracking, and electronic medication ordering. 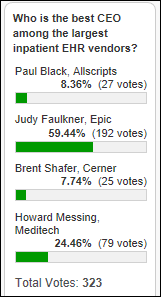 Poll respondents say Epic has the best CEO. HISJunkie says Meditech hasn’t grown, Brent Shafer is too new to judge, and Allscripts is a mess. Tripp Tart voted for Judy Faulkner in admiring her for keeping the company free of shareholder influence. Former Community CIO votes for Howard Messing since he also kept Wall Street out of the picture and is creating company growth again, while Epic’s growth is mostly due to its hospital customers acquiring more facilities. New poll to your right or here: would you be OK with insurance companies using your harvested social, financial, and lifestyle data to approve and price your medical coverage? July 26 (Thursday) 1:00 ET. “The Patient’s Power in Improving Health and Care.” Sponsor: Health Catalyst. Presenter: Maureen Bisognano, president emerita and senior fellow, Institute for Healthcare Improvement. Patients, even those with chronic diseases, only spend a few hours each year with a doctor or a nurse, while they spend thousands of hours making personal choices around eating, exercise, and other activities that impact their health. How can we get patients to be more engaged in their care, and help physicians, nurses, and healthcare providers transition from a paradigm of “what’s the matter” to “what matters to you?” This webinar will present stories of patients and healthcare organizations that are partnering together with tools, processes, data, and systems of accountability to move from dis-ease to health-ease. July 31 (Tuesday) 12:30 ET. “How to Proactively Troubleshoot End User Experience Issues in Healthcare IT.” Sponsor: Goliath Technologies. Presenter: Goliath Technologies engineering staff. An early warning system for EHR access problems helps prevent downtime and user access problems before they impacts patients and collects objective technical evidence of the issue’s root cause. This webinar will describe how hospitals protect their investment in Allscripts, Cerner, Epic, and Meditech EHRs by anticipating, troubleshooting, and preventing end user experience issues and collecting the technical data needed to collaborate with their vendors on a solution. Schoolcraft Memorial Hospital (MI) switched from Evident to iSolved HR and payroll software in June. Divine Savior Healthcare (WI) will replace Evident with Athenahealth in fall 2018. Crisp Regional Hospital (GA) will replace Meditech HR with Kronos in 2018. North Country Hospital & Health Center (VT) replaced Allscripts Paragon with Athenahealth in April 2018. Chronic Care Management, Inc. hires two former executives of its defunct competitor CareSync, Gurpreet Singh (CIO) and Marc Gauthier (head of enterprise business development). Publicly traded rural hospital operator LifePoint Health is considering selling itself to a private equity firm for up to $6 billion, with the report sending LifePoint’s shares up 40 percent. LifePoint Health also operates 15 hospitals in partnership with Duke University Health System under the Duke LifePoint Healthcare brand. LabCorp is close to fully restoring its systems after they went offline in a July 13 ransomware attack. The company’s security team detected the Remote Desktop Protocol attack and stopped it within 50 minutes, but by then, the SamSam ransomware had impacted 7,000 Windows-based systems and 1,900 servers. SamSam took Allscripts down earlier this year, reportedly also using RDP as its vector. 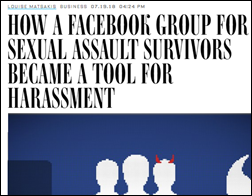 Members of a private Facebook group for sexual assault survivors find themselves trolled by new users who threaten to post the intimate details they had shared under their real names. The group was apparently created by an anonymous administrator who either had duped the members or whose account was hacked. The report by “Wired” notes a Facebook flaw that allowed this to happen – groups can be created by “pages” that aren’t tied to an individual’s profile, the same way Russian propagandists used the platform before the 2016 elections to keep themselves anonymous. I was going to play around with some Facebook group stuff but decided instead to try Microsoft Teams now that the company is offering a free tier and no longer requires members to use Office 365. 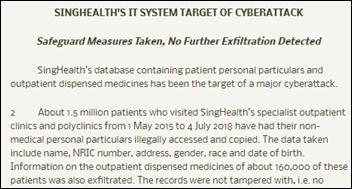 Singapore says hackers stole the information of one-fourth of its population, 1.5 million people, in an attack involving its SingHealth clinics. The hackers specifically targeted the information of the prime minister in the cyberattack that lasted from June 27, 2018 until it was discovered on July 4. They breached a specific PC and then elevated its account privileges to access the database. 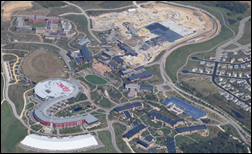 Epic’s campus is free of cranes for the first time in two decades as the company’s frenetic construction projects wind down, having expanded the campus to handle employee headcount that tripled to 10,000. Epic says that it may another set of buildings next year. The Tucson locations had a smooth transition when they originally implemented Epic, but moving to Cerner “provided fraught for some patients and staff,” with significant problems due to poor implementation planning and training. 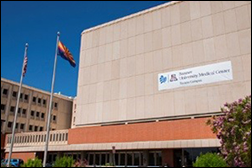 This was Banner’s first implementation in an academic medical center (the former University of Arizona Health Network) and its Cerner system couldn’t distinguish between a medical resident and an attending doctor. A near-miss infant overdose happened because Cerner was set up to order per-kg weight-based doses, while Epic had been set up as per-gram ordering. Banner’s CFO admitted to state officials last month that it underestimated Cerner’s data center and bandwidth requirements. The article notes that Phoenix-based Mayo Clinic Arizona will replace Cerner with Epic on October 6. In other Banner news from Tucson, the health system cancels its nurse Magnet status, where under University of Arizona Medical Center’s ownership in 2003, it became the first Magnet-designated hospital in Arizona. Banner will continue Magnet participation at its Phoenix campus. The existence of a poll isn’t in itself newsworthy. The poll results should disclose who paid for it, and if the poll was commissioned by an organization that benefits from its results, it is not newsworthy. Polls should include a description of their methodology and a list of the questions asked. The polled group should be randomly selected to make sure that every member of that population has an equal chance of being selected. Online polls are valid only if participants are randomly recruited, while polls of website visitors, a company email list, or Twitter should be avoided. The poll should state its margin of sampling error. Reporting on results from a poll’s subgroup – such as people of a certain age or location – may be meaningless if the sample size is small. An interesting study finds that telling students to “find your passion” for a career is bad advice since most passions are grown from experience, not discovered. The danger of the “do what you love” argument is that it encourages people to give up too easily and move on to something else if they don’t receive immediate gratification. A CNBC report notes that a roadblock to digital health company success is that apps always end up recommending that users see their doctors, which people don’t like doing and often can’t afford. That leaves apps as “a funnel or a stopgap rather than a revolution.” A cardiology fellow and digital health founder says, “All the things done well by digital health — they’re simple, fun, visual, with great user experience — are still missing from most clinical visits, so it remains pretty unpleasant to be a patient. To me, this gap gets closed by bringing the clinical experience up to the same standards as our digital health solutions.” That is pretty brilliant insight – imagine frictionlessly summoning a ride on Uber and then having a 2004 Pontiac Aztek show up an hour late with the meter already at $40 and the lost driver refusing to use the GPS. Google, Facebook, Microsoft, and Twitter launch an open source Data Transfer Project that allows people to transfer their data from one online service to another (the technical overview is here). Healthcare wasn’t mentioned specifically, but it would be pretty cool if EHR vendors provided a similar capability in allowing patients who are seeing a new doctor to initiate their own transfer of data to the new doctor’s EHR, although questions would then arise about the lack of synchronization capability afterward. Elsevier will offer its StatDX radiology diagnostic decision support tool through MModal’s Fluency for Imaging. Liaison Technologies partners with One Laptop Per Child. Pivot Point Consulting names Matthew Curtain director of business development. Sunquest will host its annual user group conference July 29-August 3 in Scottsdale, AZ. Vocera will exhibit at LeadingAge Florida July 29 in Kissimmee, FL. Mazars USA names Steven Herbst principal, health care consulting group. While true, one could also argue that their product makes it easier for organizations to consolidate on their platform. This is a clear sign that you can’t trust whoever is talking. When they say this “The Tucson locations had a smooth transition when they originally implemented Epic” then you know they’re biased. No Epic or Cerner or Meditech or any EHR has ever gone smoothly. There’s choppy and really choppy. That’s a feature of such a big software implementation. If they’d said Epic was smoother than Cerner, then you could believe them. Regarding Poll Results – thank you for reporting on this even though it is not strictly speaking health care news. It’s important, both in the realm of politics as well as fly-by-night news stories trumpeting the latest poll results of private companies. 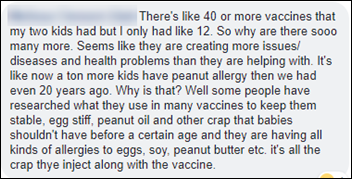 Reminds me of the old joke – 5 out of 6 surveyed researchers say Russian Roulette is completely safe. So, England has gotten over the NPfIT systems implementation failure? At least enough to try something else?